You finished graduate school with a master’s (or even a doctorate) degree, passed your national board examination, and landed your first job as a healthcare professional. You took all the right steps and put in the hard work. But you still feel like you don’t belong or deserve to be where you are. You fear your colleagues will soon be on to you and discover your fraudulent place in your new role. Your self-doubt becomes increasingly consuming. Does this sound familiar? Enter impostor syndrome. Impostor syndrome is a phenomenon where people believe they are not as intelligent or competent as they are letting on to others. People who struggle with impostor syndrome believe their success thus far is largely due to luck or chance, as opposed to hard work and qualifications. These beliefs lead to fears of being “found out” as a fraud or an impostor. Symptoms of impostor syndrome can include perfectionism, anxiety, doubt, shame, and fear of both failure and success. Impostor syndrome isn’t a new or rare phenomenon. In fact, up to 70% of people have experienced symptoms of imposter syndrome at some point their lifetime, and people in healthcare are even more prone to them.1 But what makes this experience even more relevant to us as healthcare professionals? Healthcare providers are surrounded by a slew of other high-achieving individuals, both in school and in the field. Comparison, whether intentional or not, is inevitable. It becomes second nature to measure someone else’s perceived strengths against your own perceived weaknesses. Feelings of inadequacy can set in, and impostor syndrome is often close behind. An added layer of concern, specific to occupational therapy, actually stems from one of the field’s greatest qualities. As occupational therapists, we have the privilege of using a holistic approach to address each client as a whole person. Nearly every aspect of our patients’ functional performance is within our scope of practice. This affords OTs the opportunity to work in a variety of settings\ which is amazing. However, as a new grad, this can also be daunting. You can feel confident and competent working in a setting similar to your level II fieldwork affiliations, but beyond that, other settings can seem like a completely different profession. Imagine working in inpatient neuro during fieldwork then accepting your first job in an outpatient pediatric clinic. The skills required for these two OT positions seem light years away from each other! This can lead to a dissociation between your skills, abilities, and feelings of preparedness for your first job. 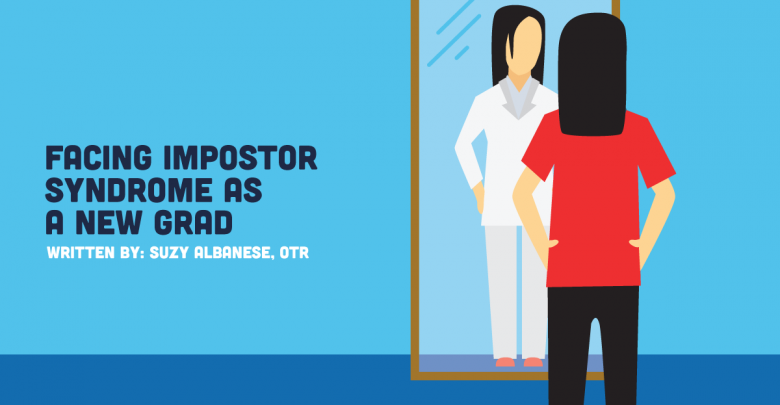 Impostor syndrome is a reasonable and almost logical response to the challenge of working in a new setting as a first-time OT. As new grads, we do have less experience and fewer achievements than those who have been working longer, but the truth is, we are not impostors, we are simply beginners. We just have to work on accepting that. So what can be done about these uninvited (and frankly, unwarranted) feelings of doubt and inadequacy, in a field where there are constant advancements, and lifelong learning is imperative? Taking action is key. Here are 5 steps to combating impostor syndrome with measurable actions to incorporate them into your daily life! This is the first step and arguably the hardest. It requires self-awareness and a long, hard look in the figurative mirror. Are you excessively hard on yourself? Are you criticizing yourself on a regular basis? Are you comparing yourself to other therapists or an impossible version of yourself? These are deep-rooted feelings that need to be addressed because often it’s easier to focus on what went wrong rather than what went according to plan. Even if something did go wrong; if you failed your fieldwork, for example, it wasn't the end! It’s almost human nature to respond this way. However, it does more harm than good, and an actionable plan is needed to reframe your thinking. Create a list of all your accomplishments to date. You graduated from an accredited occupational therapy program. You studied hard for your boards and passed. Maybe you were a graduate assistant or maintained a 3.9 GPA while in school. These are undeniable signs that you have been successful before and proof that you are capable of continued success. Continue to acknowledge and appreciate the hard work you are doing now—whether you read three research articles before bed last night or developed a new, creative treatment plan for one of your clients. Write them down if it helps you to visualize and internalize all the good you are doing every day. Practice accepting praise and compliments, both at work and in your personal life. Appreciate the positive feedback your clients, peers, and mentors provide, and try your best to internalize it (I know, it’s easier said than done)! Attribute these qualities to you, not a fortunate circumstance. Allow this proof of your competence to reaffirm your self-worth. This is crucial for any new OT, whether you are experiencing impostor syndrome or not. You may be fortunate enough to have a structured mentorship program at your first job. If not, all hope is not lost. See if there is a more experienced OT in your facility who is willing to provide guidance and/or mentorship as you become accustomed to your new role. You can also open up a dialogue with former clinical instructors, professors, or interdisciplinary colleagues. Chances are, these folks would be happy to listen to your thoughts and concerns, as well as provide insight. Connect with others through the omnipresence of social media. Social media networking can seem foreign to some. But, for as many scary people as there are online that you would like to avoid at all costs, there are even more individuals who have created platforms with the desire to connect with and help others. There are so many OTs with blogs (like OTMiri), Instagrams, you name it, that would love to support you. Sometimes, all you really need is someone to say, “I’ve been there. I understand,” to stop those feelings of doubt and fear in their tracks. Whether it be in person, online, or a combination of the two, you want to find people who will lift you up and provide an optimistic outlook. Avoid those who are too critical and can cause you distress— you have already been hard enough on yourself. NewGradPhysicalTherapy has some tips for how to approach these different groups in your life and build community through mentorship. In the past, my gut reaction to these feelings of inferiority has been to deny, ignore, and avoid any and all responsibility. Because if you’re not trying, you’re not failing, right? However, this quickly turns into a vicious cycle. You feel like a let-down, which leads you to being less motivated to work. Then you end up even less prepared because you aren’t putting in the effort. Hold yourself accountable and create goals, just as you would for a client! Ensure your goals are measurable, achievable, and specific, with a realistic timeline. Write them down! Then, develop an action plan for attaining each goal. Potential goal areas can include staying current on best evidence-based practice, healthcare policies, and news in the field. You can also create competency-based goals for specific skills and techniques that you would like to develop or sharpen. You can even reach out to your mentor(s) for tips on reaching your set goals. Meeting the goals you’ve created is another sure fire way to overcome impostor syndrome. Just remember, Rome wasn’t built in a day. You aren’t expected to accomplish your goals overnight, so try to set goals that are truly challenging. Your goals should make you a little uneasy. After all, it’s when you push yourself that you truly grow. This is another tough one, coming from a recovering perfectionist. Perfectionism has frequently been linked to impostor syndrome due to the shared feelings of criticism and self-doubt. If you are holding yourself to an unachievable standard, you will never be content. This mindset can rapidly lead to burnout at work and flood into other areas of your life, causing even more distress and dissatisfaction. The strategies to help overcome perfectionism actually tie into most of the steps you can take against impostor syndrome that we’ve discussed. Reframing your thinking is critical. The focus must be shifted from fear of failure back to your passion. No one becomes an OT on a whim. You are here because you are passionate, and you love what you do. It’s time to look at your role through this lens again. Creating a work-life balance is essential for your own well-being as well as the care of your clients. You cannot provide the best care if you are overworked, overstressed, and under-rested. It’s important to work smarter, not necessarily harder. Try some of these mindfulness tactics both in and outside of the clinic! Break your work to-do list into smaller, individual tasks, set deadlines, and focus on your goals. This way, you can prevent becoming overwhelmed by the details and intricacies of your daily routine, and actually work more efficiently and effectively. When trying to shake your perfectionist tendencies, think again to your network. Even your most admired mentors have felt inferior, incompetent, or self-conscious in their roles at some point. They have made mistakes. The journey that lies ahead of us as new OTs is one that they once had to overcome as well. You too can and will succeed, but perfection shouldn’t be the end goal. You’ve finally made it as an OT! It has taken years of coursework and clinical fieldwork affiliations to get to this point. Now you get to reap the benefits of working in your dream field. We get to serve others for a living and have fun doing it. Try not to take yourself too seriously, laugh with clients when something is funny, and give yourself some grace. In your time outside of work, participate in meaningful occupations that relax you and make you happy. I wrote this for you, fellow new grad, in hopes that you feel less alone and more prepared to tackle impostor syndrome. But, I also wrote this for myself. It helped me process my own thoughts and feelings on the matter. I still have my confidence journey ahead of me as a new OT and am prepared to stay the course. Have you dealt with impostor syndrome as a new grad or even as a seasoned pro? Comment below­—I would love to hear about your experiences. Feel free to share any tips or advice that worked for you!